An ill-favoured thing sir, but mine own! : New Year! New Resolution! So 2009 started and for the first time in my life, a year looks so promising at the beginning. Believe me usually I am the ‘New Year, So what?’ kind of a guy. But this time round I feel really exited. And part of it is because of my new year’s resolution. To loose atleast 15 Kgs in 2009. If you have known me from last 6-7 years then you probably know that there are FAT and Slim (OK not slim but definitely ‘not fat’) phases in my life. And for last 1 and half years I have been Fat. So I have decided enough is enough. The time has come for the Slim phase to set in. On our regular walk from Charu’s (A restaurant where my colleagues and I eat our lunch) to our office, I told Archana about my resolution and said (all too prudly), “I am going to loose 5kgs in January”. Archana looked at me for one second and she started laughing and said not possible. So I challenged her that I will do that and she accepted a bet of Rs. 500. If I loose 5kgs by 1st Feb. 2009 I win the bet, other wise she wins. And I hear when Salil heard of this bet from Archana, he also agreed to a bet of Rs. 500. And when Tushar heard of this bet, Tushar being Tushar, placed a bet of … hold your breath… Rs. 5. So that’s Rs. 1005 to loose or win. Now that’s some motivation and I am not going to loose. So as a proof of the bet Archana and I went to Corn Club where I weighed and here is the “Agreement” between Archana & I and besides it is a photograph of ME wearing the same cloths and shoes which I was wearing at the time I weighed. So anyway, guys wish me luck. Soon you are going to see slim Pritam! 1K? That's too big for a guy who earns in indian rupees. But I am not going to loos right? So what's 1K. Guys don't underestimate me. Somehow I sense year 2009 is year of change. Well I don't know about the world but I am going to change for sure! hi every body!... i too will be on pritam's side to encourage him and i knw this year is something special for him and me too :) ( we both being cancerians) i had read it in some astro prediction that we will be financially happy this year... and all you people i.e. salil, archana and shilpa be ready with the money... moreover... i am not willing to share the burden like swet if pritam loses.. coz i know that he will not lose the bet but will surely lose the weight... what say???? Yep, I am dieting as hard as I can. Today I was with one of my friends at Durga. He had a Anda-Bhurgi and a hot coffee. And I was just sitting in front him sipping water. Man that was tough! but imagine how a skeleton of panda would looks like?? i guess panda!!! lose the weight fool you look UGGGGLYYYYYYY!!!!!!!!!! Don't know what's gonna happen. There is twist in the tale. 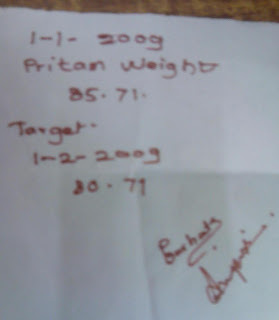 I was 4 kgs down on 23rd. But then I went home on 24th and 25th and screwed up everything. Ate a lot. Must have put on something like a kg or so. But from yesterday I am on strict liquid diet. And I am hoping for the best. Meanwhile I have started to get dreams about food. God help me. I am scared. Stop me from sinning!!! Guys wish me luck. I need it badly. awh! !....have a food festival in feb...put on 10 kilos of weight ..or whatever...but the point is "-5 kilos by 31 jan"...thats all.